Deanna (Tovah Feldshuh) and the rest of the Monroe’s are grieving privately until Carol (Melissa McBride) drops off a sympathy casserole – of course, thanks toFather Gabriel’s (Seth Gilliam) little chat last week, she ain’t eating the food. 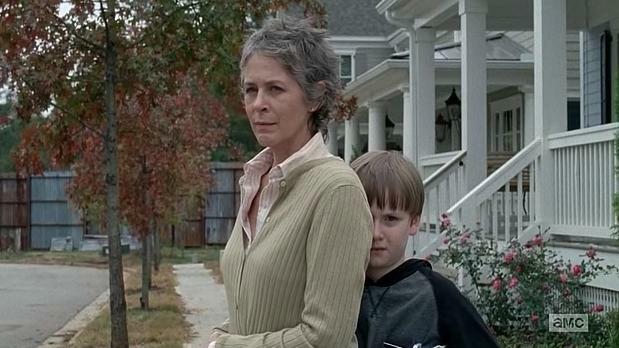 Speaking of Carol, is it just me or are AMC dropping Carol into every scene that involves flowers? The lady above has the letter ‘W’ inscribed onto her forehead and this seems to be a common theme this week, no doubt culminating in a big reveal for the Season 5 finale next week (and I suspect it will be the big bad thing coming by way of whatever Deanna is recruiting people from the outside for). Glenn (Steven Yeun) head fucks confronts Nicholas (Michael Traynor) and they come to an uneasy understanding about what happens to rat bastards who don’t listen to Glenn. I can see the whole Nicholas character imploding at some point soon. His character lies his way through a video interview with Deanna before this and even though Deanna won’t eat Carol’s offering, she still knows her own residents and asks all the right questions. Oh, and that gun Rick (Andrew Lincoln) hid when they first came to Alexandria? Yeah, it was nasty Nick who pinched it, which makes me wonder if the guy is smarter than he appears. 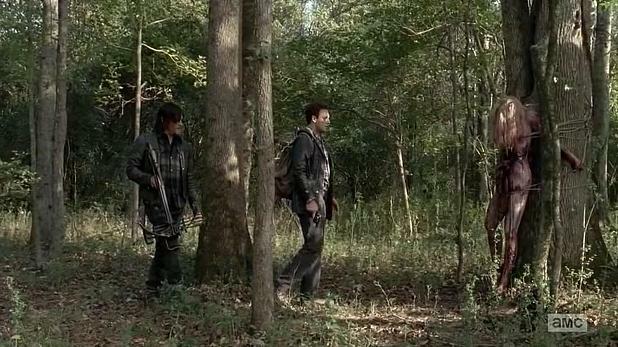 Carl (Chandler Riggs) and Enid (Katelyn Nacon) blow the joint and end up standing inside a tree nearly K.I.S.S.I.N.G. while walkers roam past. Sasha (Sonequa Martin-Green) is flipping out over Noah’s death this week. Although, I think it is also a bad case of PTSD as well. Michonne (Danai Gurira)and Rosita (Christian Serratos) – who looks a lot like Tara (Alanna Masterson) when she puts more clothes on – are tracking her down and helping out no matter how much the woman says she doesn’t need it. 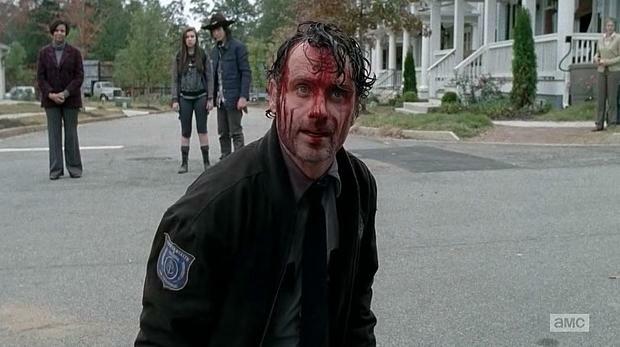 So, what did you think of Episode 15 of AMC’s The Walking Dead? 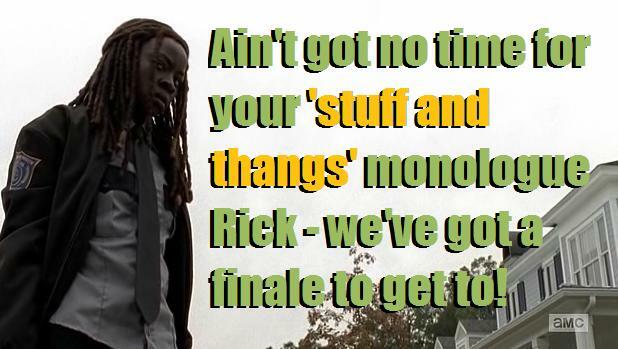 How do you think it will pan out in the Season 5 finale next week? Will we ever see Morgan again? Let me know your thoughts by commenting below!